Also known as “Violet Stargazer” and “Violet Star”. One of the most Popular Viticella’s from Lemoine et Fils. When in bloom Wow! best describes it. Purple flowers with dark purple anthers and an illuminating white bar.A must have in every garden. Easy to grow and free flowering. Bright reddish Pink flowers produced freely over a long time. Flowers start out nearly red and lighten as they open. 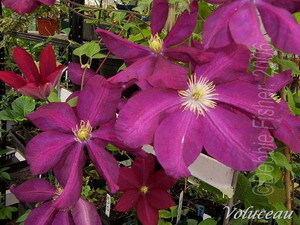 A widely known and grown clematis raised in 1899 by Francisque Morel of France. I am happy to have Viola in stock again. This Seedling of “Lord Nevill” is one of the most beautiful Deep Purple Clematis with Yellowy Green Anthers that gets darker with age. Easy, hardy and free Flowering too. This hybrid of 'Ville de Lyon' has very large Red pink flowers and yellow anthers. 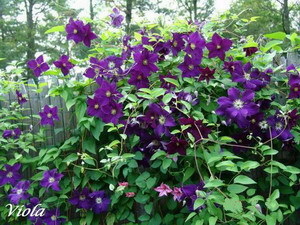 Free flowering.Large flowers for a type 3 clematis. A must have in the garden.